This pretty dish was created after I once again bought too many squash at my local green grocery. I find at the end of summer when fresh seasonal vegetables are abundantly available I am always buying too many, and then find myself spending a lot of time in the kitchen thinking up new ways to prepare them. This mix of zucchini, summer squash, cherry tomatoes and fresh herbs was delicious both the day I made it and the next day when I used it in my morning frittata. This pretty dish was created after I once again bought too many squash at my local green grocery. Cut the zucchini and squash crosswise into 1/2 inch slices. 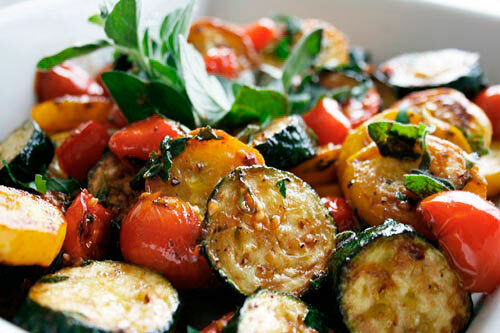 In a large frying pan, heat the olive oil over medium heat and add all the squash rounds. Cook, stirring frequently until fork tender, about 10 minutes. Add the garlic, tomatoes, and fresh herbs. Stir to mix and continue to cook until the tomatoes soften.